Police in Santa Cruz, California, have released this photograph of the bank robbery. (CNN) -- A bank robber masquerading as a bike messenger has struck again. The serial bandit, who uses a two-wheeler to pedal away from his heists, held up a bank on Monday afternoon, the Santa Cruz, California, Police Department said. "He rolled in on a bike," police spokesman Zach Friend said. "We spoke to the FBI and they believe he is associated with other robberies in the San Francisco area." "It could be just an easy transportation point to a vehicle," Friend said, "so it's quite possible there's a vehicle parked in the neighborhood." 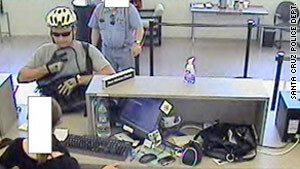 According to investigators, the suspect entered the bank wearing a helmet and carrying a black messenger bag. He handed a teller a note demanding money and said he had a weapon, police said. The robber left with an undisclosed amount of money. "It's one of those things where the teller was legitimately scared," Friend said. "If somebody comes up to the front and says they have a gun, that is a very traumatic experience. The teller did everything she was supposed to do." The suspect was last seen pedaling away from the bank. Friend said the bicycle may give a criminal an advantage. "It affords greater opportunity of entering into smaller areas, alleys, hiding in driveways," he said. "It makes the suspect smaller than a vehicle would." The serial bank robber is described as a white male in his 40s. He has brown hair and is believed to be 6 feet 1 inch tall and 170 pounds. Anyone with information is asked to contact the Santa Cruz Police at 831-420-5820.